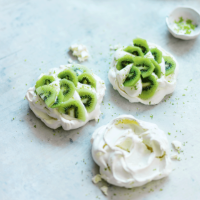 Chewy, marshmallow-centred meringues with a creamy coconut filling are a perfect match with zesty lime and kiwi – a great summertime dessert. 1. Preheat the oven to 170°C, gas mark 3. Line 2 large baking sheets with baking parchment. 2. Place the egg whites and caster sugar in a large heatproof mixing bowl and set over a pan of gently simmering water. Using a handheld electric whisk, beat the eggs and sugar until the sugar has dissolved. When the mixture feels warm, remove the bowl from the heat and continue to whisk for 4-5 minutes until you have a very smooth, stiff meringue. Fold through most of the grated lime zest, reserving a little to decorate. 3. Spoon 6 even-sized 10cm mounds onto the prepared trays, spaced well apart, then, using the back of a spoon, make a dip in the centre of each to create a nest shape. Place in the oven and reduce the heat to 140°C, gas mark 1. Bake for 1 hour, then turn off the oven and open the door slightly to allow the meringues to cool completely. 4. For the coconut-cream filling, place the coconut cream, double cream, icing sugar and vanilla in a bowl and, using a handheld electric whisk, beat until soft peaks form. 5. To serve, spoon the cream into the centre of the meringues, arrange the slices of kiwi on top and sprinkle with the remaining lime zest.